The addition of a Kayak pool increases the value of your home, and provides family time for fun and recreation. Kayak pools are above ground and require less space than an in-ground pool. Kayak pools are also portable and can be removed or taken when a home is sold. Installation is relatively simple and can be done by a person with little or no handy-man experience. 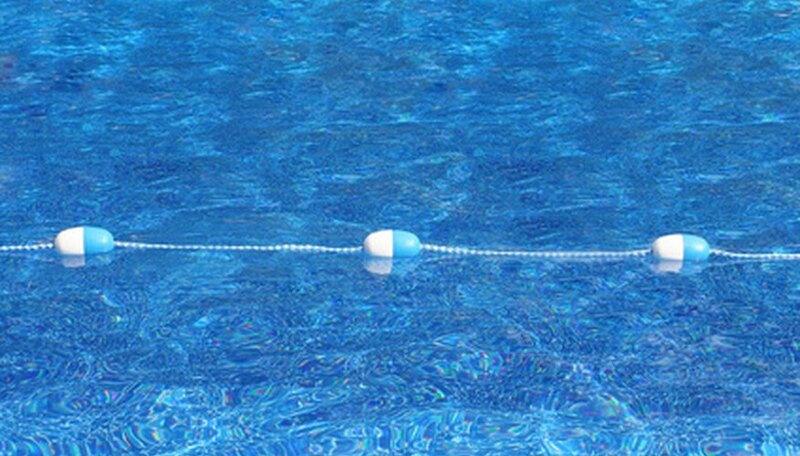 Measure a length of string according to the diameter of your pool, plus 12 inches. Attach the string to a stake. Hammer the stake into the ground in the location where you've chosen to place your pool. Pull the string taut and use white powder or a lawn edger to mark the diameter of the pool. Mark the position of the taut string with a marking or lawn edging tool. Chalk dust or stakes work well. Avoid spray paint as this can damage the lawn. The stake will be located at the center of the pool, clearly mark the diameter to remove top soil. Remove the grass to the roots. The ground must be absolutely level and clear of all sharp objects, especially roots. Roots can re-sprout and damage the pool's lining. Use the two-by-four, or a long, straight board with a carpenter's level, to assure the ground for pool placement is absolutely level. Remove dirt to the lowest spot; do not add dirt to low areas. Place the curved bottom rails in a circle along the circumference of the cleared pool area. Assemble the rails with the bottom plates face up. Squeeze the rails between your thumb and forefinger, to assure fit. Assure a true circle through measuring the diameter again. Once a true circle is formed, attach the bottom rails at every other rail with screws and a screwdriver, taking care not to scratch the rails. Assemble the uprights. These are clearly marked in the package from Kayak. On most models, the upright will have an extra hole in the top or the side. It is helpful to lean the uprights against a fence or other sturdy object. Should the model purchased require deco-strips, attach these first. Using the double-sided tape provided, stick one piece on each upright first. Then, match the holes on the deco-strip to the upright. Screw in a single screw, only in the center hole. Place landscaping stakes about 6 inches apart around the circumference of the pool. This assists in holding the wall up while the wall is attached. Unravel the pool wall, using the carton the pool came in as a guide. Insert the wall into the bottom rails. Unravel a little at a time as you attach the wall to the bottom rails. Assemble the wall joints. The attached aluminum strips should not touch each other. One bar will be inside the pool, while the other will be outside the pool. Insert bolts from the inside of the pool and assemble the nuts outside the pool. Do not tighten nuts and bolts until assembly is complete. Cover the bolt heads inside the pool with three layers of duct tape. Install the uprights to the bottom plates. Screw the uprights securely into the bottom plates. Build a "pool cove" with the sand around the outside diameter of the pool. Build a 2-inch base around the entire area of the pool to protect the pool liner. The amount of sand will depend on the pool's diameter. Punch out the skimmer and return holes with a hammer and screwdriver. Use duct tape to cover the rough edges and prevent corrosion. Carefully follow the instructions provided for your specific pool kit to install the skimmer and return hose. Install the liner. If you have a print liner, place the liner print side up. Place the liner at the center of the pool, with the seams facing down. Do not place the liner over the skimmer and return hole. Spread the liner so that the bottom seam is resting on the pool cove built from sand. Hang the liner over the wall. Be sure that the liner wall seam is straight up and down. Secure the liner with the provided plastic coping strips. Continue around the pool, pulling the liner evenly until there is no excess. Remove any wrinkles by pulling the liner at the side. There should be no gap between the liner and the cove. Begin filling the pool. When the water is 1 inch deep, check for levelness. If water runs to run side, pull the liner to make the ground level. Do not cut the skimmer and return holes in the liner until it is fully adjusted and the pool is one-third filled. Stop filling the pool once it is either one-third full or filled to a depth of 1 foot.. Begin at the wall bolts, pushing the first inner stabilizer rail over the plastic coping so that it fits snugly. Roll the liner inward to hide any excess under the rail; do not cut or trim the liner. The tapered end of the stabilizer rail should be inserted about 1 inch into the adjacent stabilizer. In this way, the last stabilizer can be adjusted to the other rails as needed. Pull the front of the top plate, the hooked part, over the stabilizer and use two screws to secure each upright to the pool. Secure all top rails with screws into the corresponding holes in the top rails. Do not tighten the screws until all the top rails have been installed. Another person is helpful during this step because a rail can cut the liner if it falls into the pool. Tighten all screws once the top rails have been installed. Attach the top covers. Depending on the model of your pool, the top covers either clip on or are attached with screws. Finish filling the pool.